One of the big differences between digital and paper operations is the control you have over who sees what - and when. Trail gives tasks start and end dates & times. This prevents everything being checked off in one go, or starting the wrong task early. It also hides future tasks so that teams are focused... and then finished. The working day is broken into timeslots which are like start & end shortcuts. They can be customised for each site - just ask Trail Support over chat to make changes to your business hours. Pick from the most common repeat options, or build a custom schedule. Tasks that span several days can be snoozed to the next day. it to appear and when it's due. You can select the date and the time of day you want the task to appear. 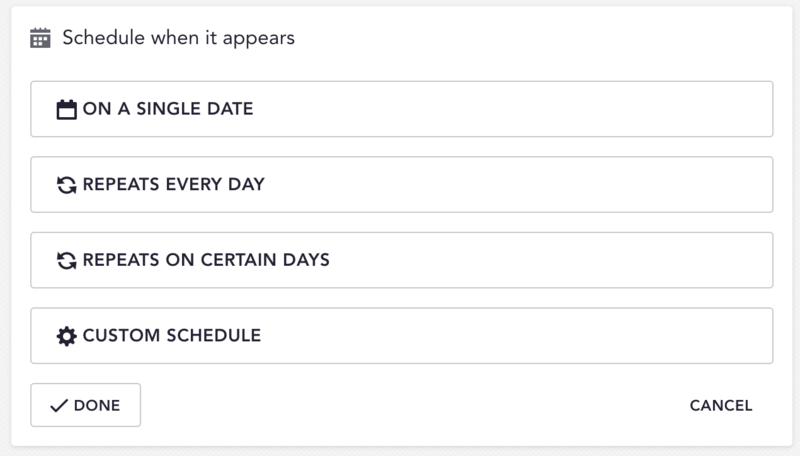 You can select which days of the week and the timeslot you want it to appear in. These options are more advanced, for when the options above don't meet your needs. First, you can select the start date, if you don’t want the task to start today (which is the default). Clicking the box that says “Today”, a date picker will appear. You can select the date from there. Next, select the due date. Click the box that says “Due Date” and choose a date from the date picker. At this point you can decided if you want to specify start and due times, which can be specific times, or timeslots. The default times are “All Day”, so you can leave it as is if you want the task to float throughout the day, each day, until it’s due. Then select from the drop down options what time you’d like the task to start and what time you’d like it to end. 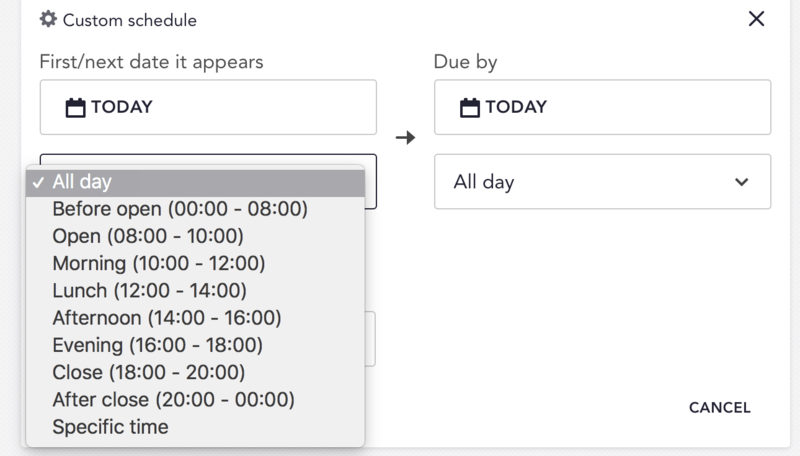 In the drop down, you’ll see the options for timeslots and for specific times. 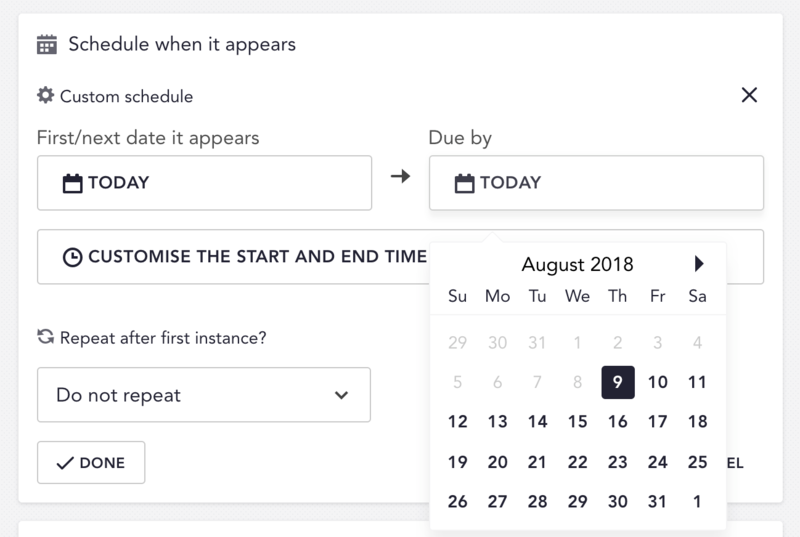 Lastly, you can specify how often you want the task to repeat (or to not repeat, if it’s a single instance) by opening the drop down options beneath where it says “Repeats after first instance?”. The options are “Does not repeat”, “Daily”, “Weekly” and “Monthly”. 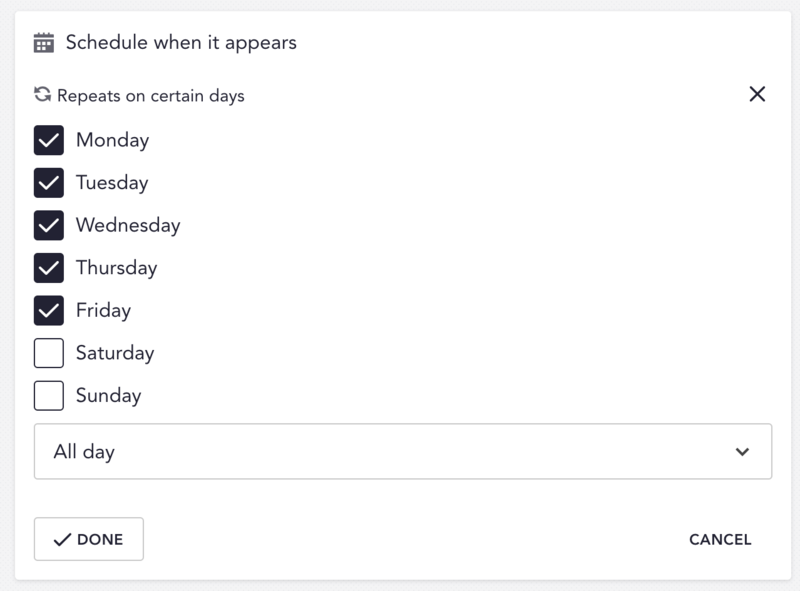 There is also a box under these options that gives you even more flexibility with scheduling, by letting you choose the number of repeats. For example, every 3 days or every 2 weeks. When you’re finished, click “Done”. And that’s it!